On my recent trip to Holmes County, Ohio with Lisa Bull, we spent a lot of time driving around and looking at the scenery. You simply cannot beat the scenery: rolling hills and beautiful farms with the occasional Amish buggy passing by the car. It’s just gorgeous, especially in the winter. At one point, we passed by a farm where the Amish farmer sold pumpkins. Lisa took the above photo and I wanted to comment on this. The Amish in the Pennsylvania community that I am familiar with are remarkably fair. They are so fair that when you go out to dinner together, they insist on contributing to the gasoline! When you buy something from them, even a small block of cheese, they add tax to the purchase. And, if you bring them something, such as a gift of whoopie pies or cookies, they want to pay for it. So I was really surprised to see that this farmer was charging $3.00 for what I would consider a small-sized pumpkin. 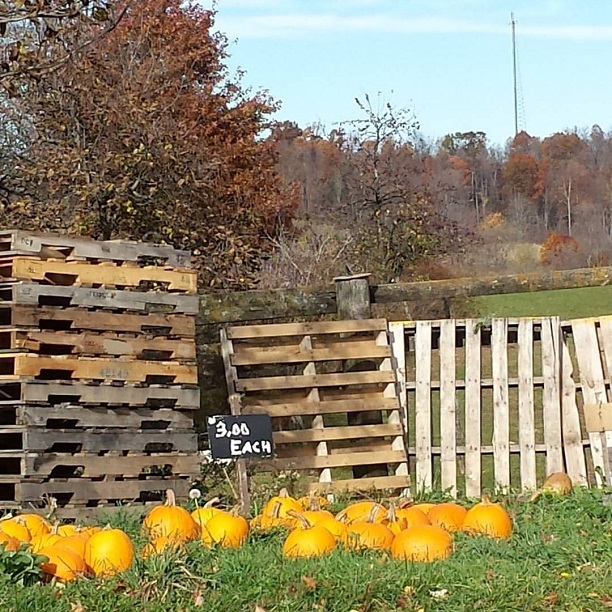 From what I’ve seen, most farmers charge $2.00 for small pumpkins…at least in this same area where we were driving. At first, I was taken aback. $3.00 for a small pumpkin when other farmers’ charge $2.00? That didn’t seem fair! But after I thought about this (and yes, I did think about this for a while—that’s what I do), I realized that this Amish farmer was not being unfair to the potential customers. Instead, he was being a smart entrepreneur. If someone stops and buys one of his pumpkins, he just made 50% more than the farmer down the road! Maybe that’s not fair to the other farmer but it’s a sound business decision. I suppose I’m just used to the Amish working together on the sale of goods from the farm, most items the same price and certainly not 50% more than their neighbor. Maybe this particular farmer had his prices posted before the OTHER farmer who decided to lower his price in order to attract more local customers and thus undercutting the $3.00 farmer! What I learned from this is to refrain from jumping to conclusions. There are always multiple sides to every story. As for me, I will have to stick to my $6.00 small-sized pumpkins since that is the best deal I found near Morristown, NJ and hope that somewhere an Amish farmer is reaping some profit from my purchase!!! I have finished the first read of the (Plain series) I’m impressed and surprised with the out comes!! I’m anxious to read Plain Choice coming in March 2016—-thank you for writing these. Thank you for your blog!! Can you explain how the Amish change their hard benches (during church) from benches to tables for their meal?? How do they build their homes to be able to remove or slide walls to make room for their hard benches?? I read your Post – Maybe he was selling the Pallets..?. Even $3.00 around here in NE Ohio is a Bargain. about 40 miles west of here a Local Nursery was selling their pumpkins at $6.50 and UP…. Have a Great Fall.!! !